Fuzzies are pretty social. And they love to cuddle up together for a nap. But that doesn’t mean you’ll never see fighting ferrets. Luckily, not all brawls are serious. And they start for all sorts of different reasons. 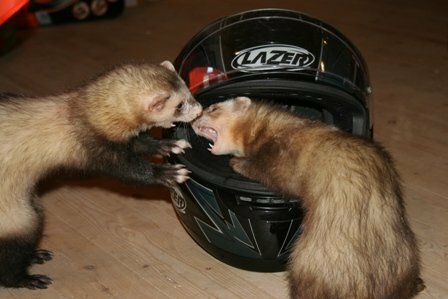 Keep reading to figure out in which ferret fighting category your fuzzies are. One thing to keep in mind, even though fuzzy teeth are sharp, their skin is even tougher. So when they nip you and break your skin, when they nip another fuzzy just as hard they ’ll barely feel it. If your fuzzbutt decides to fight with another type of animal, be it a human (yes, we’re still animals), dog, cat, snake (yikes!) or piranha (? ), it’s usually because he’s scared and feels threatened. Make sure your other pets don’t corner him and provide him with plenty of escape routes or hutches, like a box only your fuzzy can get into. The first time you see your fuzzbutts doing the weasel war dance, you’ll either think they’re having some kind of seizure, or you’ll think they’re about to launch a vicious attack on each other (or yourself). It’s all in good fun though. They will bite, snap, hiss, dook, roll over each other and bump into things. No fuzzies are hurt during the weasel war dance (unless perhaps when they fall off the couch). As a matter of fact, the more your fuzzbutts like each other, the more they’ll play fight. As with all social animals, fuzzies have their own set of ranks and rules. The more dominant fuzzbutts will want to rule over the others. Fighting ferrets trying to outrank each other usually start with a lot of show; fluffy fur, hissing, bumping and even screaming. Less dominant fuzzies will take the hint and submit without putting up any kind of a fight (they know they’ll lose so why risk getting injured, right). If the ferret fighting continues, the dominant fuzzy will scruff the other one, roll him over and even drag him around. The one being scruffed will likely do a lot of shrieking. Rest assured it’s not out of pain, more out of embarrassment for being dragged around like an old rag. When the loser admits defeat, the fuzzy king will hobble off content, after successfully showing his minions who’s boss. Unfortunately, fighting ferrets who want to become the fuzzy king can turn pretty nasty. If the loser becomes scared because the winning ferret is becoming too aggressive, he’ll bite him in an attempt to free himself so he can run away. 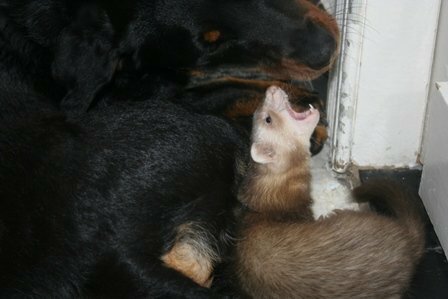 If he’s unfortunate though, the dominant fuzzy will just chase him and the whole ferret fighting starts again from the top. Although this looks cruel and it’s painful to watch, it’s important to stay out of it as much as you can. The sooner your fighting ferrets have determined their place, the sooner the brawls for dominance will stop. Especially when you’re introducing a new ferret, fighting can occur because the established fuzzy family sees the new guy or gal as an intruder. These fights are usually quite intense compared to dominance fighting. And most of the time, one of the fighting ferrets will end up with scratches or bite marks. Luckily, they usually aim for the neck and between the shoulders when biting, where the skin is a lot tougher. These kinds of fights can go on for quite a while, until all fuzzbutts accept each other, but they won’t kill each other. 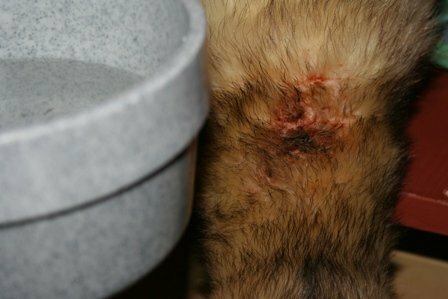 All you can do in the mean time, is keep their wounds clean with some antibiotic ointment. Fighting ferrets usually don't fight till death. This only occurs when there are females involved and hormones are raging. If you have two males that don’t really know each other and that are in a rut, do not put them together when there’s a female in heat present. You’ll either end up with 2 seriously injured fuzzies, or, worst-case scenario, 1 dead male. If your males are neutered and one of them starts to show signs of sexual aggression, take him to the vet, this could be a hormonal problem or a symptom of adrenal disease. Some fuzzies are so territorial that they pick a favorite spot somewhere and will attack anyone who dares to come near it. If you have more than one ferret cage, a fuzzy entering the wrong cage may also be enough to trigger an attack (or at least a lot of hissing) from a territorial fuzzy. Madonna may be the material girl, I have one very materialistic hob; Nibbler. My dog’s toys are hidden all over the place and guarded with a lot of hissing and puffing. Squeaky toys are the only toys that can get some kind of a possessive reaction from my other fuzzy Stitch. They usually end up on either side of the toy, hissing, pulling, puffing, bumping into things. Some fuzzies show the same behavior over food, luckily for me, mine don’t (at the most they’ll try to push the other ones head away from a kibble or treat). Sometimes fuzzies are just not in the mood to play. So when one of them repeatedly invites another fuzzbutt to play, he’ll get annoyed and some dominance bickering will ensue. This is very common if you have older fuzzies and younger fuzzies who seem to have taken a bath in red bull. I read somewhere that researchers discovered fuzzies fight more during fall and spring. Even the neutered ones. I don’t remember where I read it, so it could be a load of baloney. However, I do seem to notice a little more ferret fighting when spring is in the air. So there might be some truth to it. Let me know if you’ve experienced something similar. Adding a new ferret to the family? Then check out these tips to avoid trespassers fighting. A squirt gun can also come in handy if your fighting ferrets are getting too rowdy. Not all methods work on all ferrets. And in the end, it’s up to them to get along. You’ll just have to be patient and try not to cringe when you hear all the shrieking and see some blood. It’s part of ferret life, the sooner they work out their differences, the sooner you’ll enjoy the weasel war dance.